Video clip synopsis – When right-wing agitator Francis De Groot upstaged the 1932 opening of the Sydney Harbour Bridge and sliced through the ceremonial ribbon, the antique sword he wielded cemented its place as an Australian national treasure. Broadband MP4 degroot_bb.mp4 (19.1MB), suitable for iPods and computer downloads. 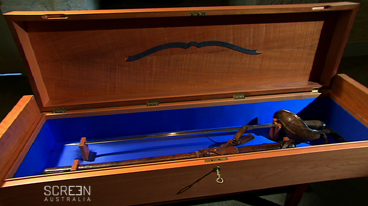 Francis De Groot’s Sword is an episode from the series Australia’s Heritage – National Treasures with Chris Taylor, produced in 2009. The building of the Sydney Harbour Bridge as a transport facility linking the city with the north shore of the harbour was a major event in Australia’s history, and represented a pivotal step in the development of modern Sydney and one of Australia’s most important cities. Convict architect Francis Greenway had proposed a bridge over Sydney Harbour to Governor Macquarie as early as 1815. Tenders in 1900 to design a bridge resulted in all 24 schemes being rejected. Eventually a design for an arched bridge was begun in 1912, completed in 1916, and construction began in 1923. Completion of the bridge in 1932 coincided with the darkest days of the Depression and many of the bridge workers released from their construction tasks swelled the growing ranks of the unemployed. New South Wales Premier Jack Lang championed the workers’ cause. This, and Lang’s decision to snub British royalty at the bridge’s opening, over which he would preside instead, incurred the anger of the New Guard, a right wing militia organisation styling itself as a citizen’s army to assist the police maintain civil order in times of unrest. Funded by the ‘establishment’ and drawing heavily on the veterans of the First World War, the New Guard, of which Captain Francis De Groot was a leading member, saw its role as defending the peace and keeping subdued any potential uprising by unionists, the unemployed and the working classes all of whom they viewed as communists. Lang with his support for the working classes and his defiance of the establishment’s subservience to the financial institutions of Britain was an anathema to the New Guard who viewed him as a danger to Australian society. The events surrounding the opening of the bridge embodied all the political tensions of the time. Explain why Francis De Groot upstaged the New South Wales Premier, Jack Lang, at the opening of the Sydney Harbour Bridge in 1932. Comment on why De Groot was never jailed for his actions in interfering with the opening of the Bridge. What is the national significance of De Groot’s Sword? How and when did it find its way back from Ireland to Australia? In pairs carry out research then prepare a double-page spread as though for a history magazine aimed at the general public, about the rise and fall of both Premier Jack Lang and the New Guard (the right-wing organisation to which De Groot belonged), during the Great Depression. Include illustrations and photographs where relevant. Write a commentary on the historical, practical, social and cultural importance of the Sydney Harbour Bridge, and speculate on how the city may have developed differently, and even whether the nation’s history may have altered, had not the bridge been constructed.